Vodka Limeade Punch is perfect for any party! It’s an easy punch recipe made with limeade concentrate and vodka. 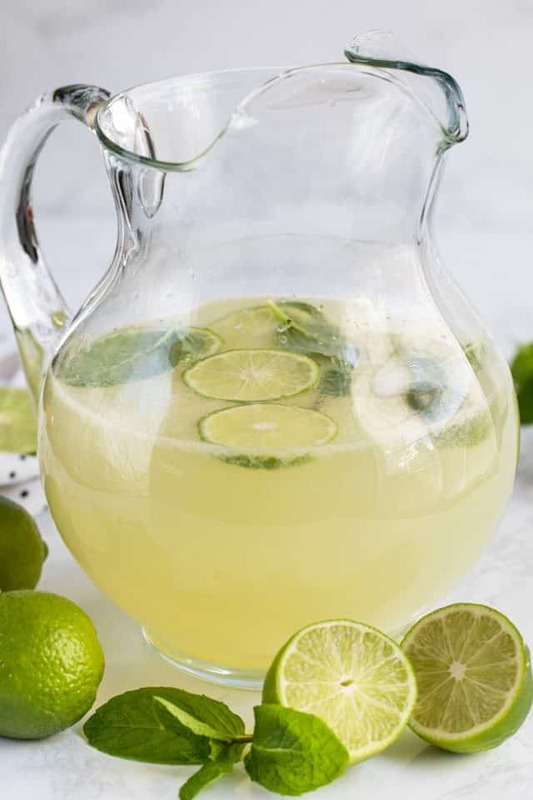 This is the BEST limeade recipe and the perfect party punch! DTLA is a thing. Like, I’d never heard of it before watching Good Trouble and then all of a sudden it’s everywhere and Downtown LA is a THING. Hotel Indigo is super cool, at least in DTLA. I’ll be looking them up in other cities too! Lime cocktails are sooooo good. On our last day we were hanging out in the hotel lobby having drinks while killing time before heading to the airport. On the menu they had one made with gin, lime juice, and mint. Now, I’m not a gin girl but it sounded like a mojito, so I went for it…and then had a second. Now, upon first taste, I realized the menu left something out of the list of ingredients: sugar. The cocktail was SO sweet it didn’t taste like a mojito, it tasted like I was drinking limeade…and then this party punch recipe was born. 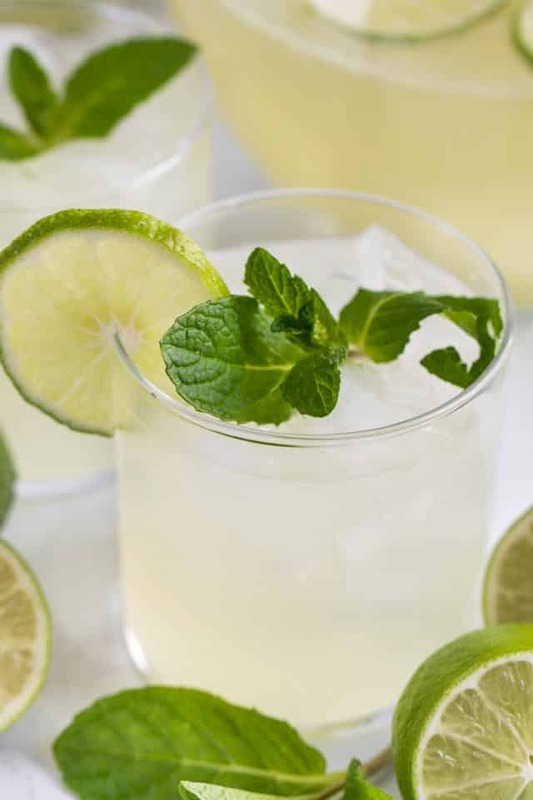 I decided that, instead of remaking this cocktail with simple syrup or super fine sugar, that I’d just use limeade concentrate. 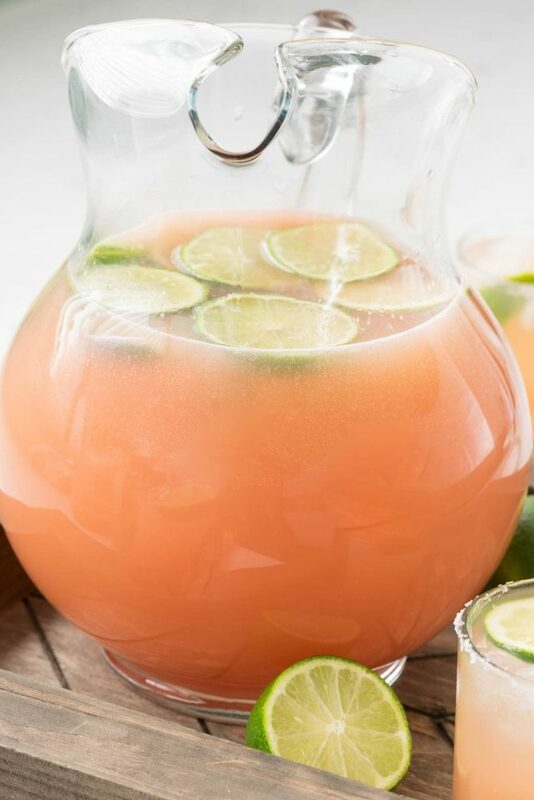 With it’s extra tart flavor, I like limeade almost more than lemonade, and mixed with alcohol…well it’s the perfect party punch. Basically, using limeade concentrate in this punch recipe takes out the middle man: simple syrup. Limeade concentrate is a mixture of lime juice and simple syrup (or sugar). It comes frozen with the other frozen canned juices and you reconstitute it by adding water. I also decided to add a little triple sec to this punch recipe, so it would have a little more depth of flavor. 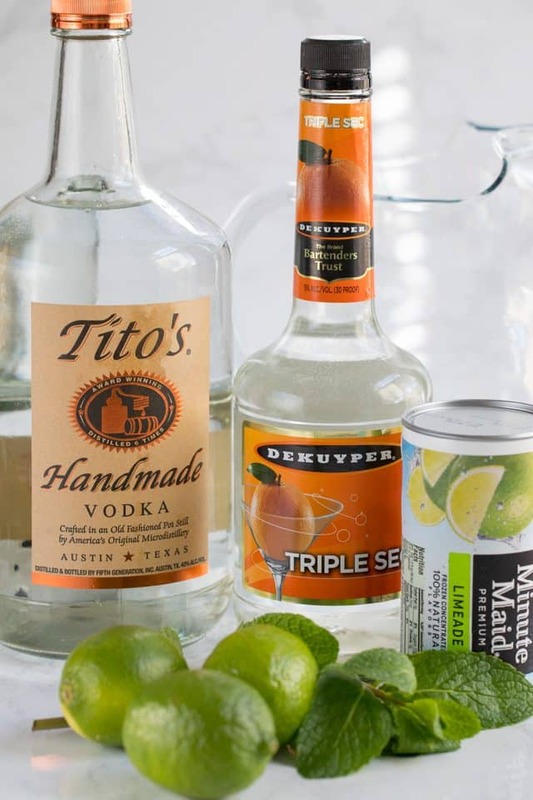 Triple Sec is orange liqueur, so it goes with the citrus of the lime. Now, normally you just mix the limeade concentrate with water, but in addition to the alcohol I made this a sparkling limeade punch. How do you make sparkling limeade? You can turn limeade into sparkling limeade by adding club soda in place of the water called for on the can. Of course you can use sprite or 7up, but I feel like that adds a lot of sweetness and limeade is already very sweet. Club soda adds the bubbles without the sugar. 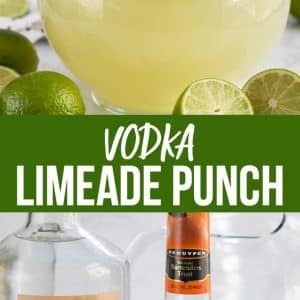 Vodka limeade punch is the perfect party punch cocktail for any party because it’s easy to make by mixing lemonade concentrate with vodka. 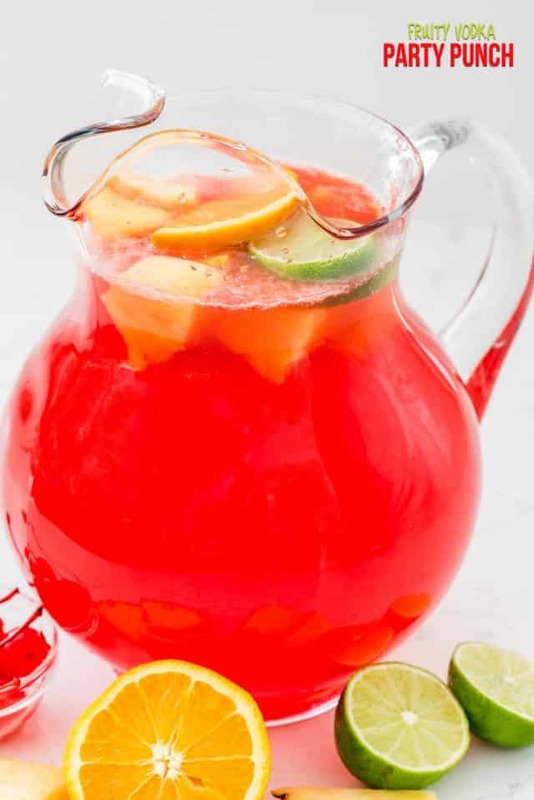 This party punch is going to be the hit of all of my parties this spring and summer. It’s got that perfect fresh and summery flavor, and will be great for any party. I’ll be serving it for Super Bowl and the 4th of July and so many more parties! You can also make this cocktail into a non-alcoholic mocktail by omitting the alcohol and adding more club soda. Then the kids can enjoy it too! Vodka Limeade Punch is perfect for any party! It's an easy punch recipe made with limeade concentrate and vodka. Mix all ingredients in a large pitcher. Stir. Add limes and mint for garnish. Serve over ice. I used a full 33 ounce bottle of club soda. Use as much as you think you need to make the limeade to your liking (sweetness and strength). Fruity Vodka Party Punch is another great drink for a party! 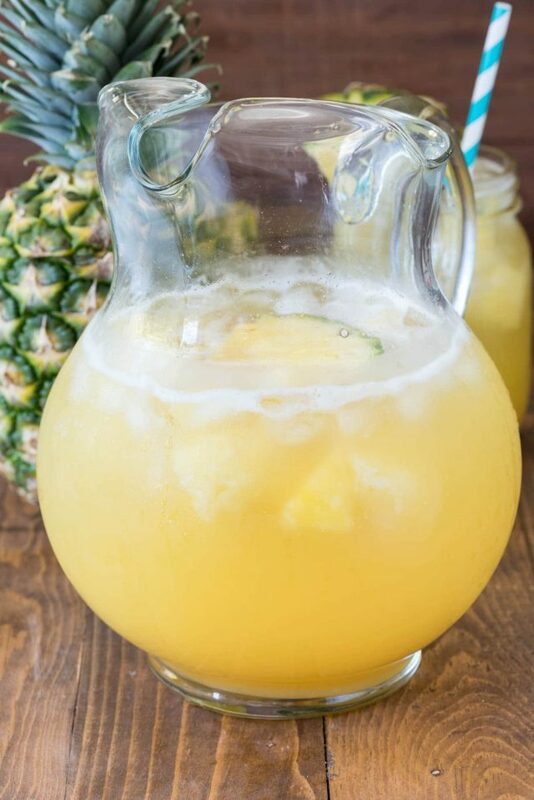 Pineapple Party Punch starts with Prosecco! Salty Dog Cocktail Punch is another vodka party punch! Sparkling limeade? You just blew my mind! Why I have I never thought to do this? I love bubbles. Then you add vodka? It’s a win-win! I will definitely be making this!